When I moved to Austin Texas from Chicago three years ago, one of my first realizations was that I was now living in the gluten free city and everything was gluten free or vegan but sadly everything had a lot of sugar to compensate the texture. I was in such shock that I even talked to the Chef of Whole Foods (the WF flagship store and main headquarters) at that time Chad Sarno and said: listen there are NO real healthy sugar less options here. Take the gluten free breads for instance: they are mostly made of starches which you may know are very high glycemic and for hypoglycemics and diabetics this is not a good option. So now that I have been of gluten almost 95% of the time because I have psoriasis (I only test a fantastic recipe that I want to adapt which is very rarely) I need to make gluten free products that are low glycemic/ as much as possible. It has NOT been easy to go gluten free, (believe me when you start removing your favorite things like breads and pastries, it really challenges your soul. It has been a journey of letting go of sugar, gluten and so many processed foods. As a pastry chef it has been even more difficult as this is what I know and love and it goes back to my most cherished moments when exploring bakeries made me the happiest. So this started a journey of pioneering a sweet. healthy world where I had to challenge the status quo and create my own Noble Baking. At first people though I was crazy and way to progressive (that was in 1994). So as you can imagine being a pioneer and trail blazer has not been easy. Now even my husband has gone of gluten due to stomach problems! And croissants and mac and cheese where his confort food. So I am happy that we are creating new options every day. Place and mix the water and eggs in your beater’s bowl by hand. Add the flour, ground flax seed, powdered milk, psyllium, salt, coconut palm sugar, dry activated yeast, and baking soda and beat at low speed with the beater. Add water little by little, making sure to work in the mix that sticks to the sides of the bowl, until the mix thickens and becomes sticky after approximately 6 minutes. Once thickened add the seeds and mix them in. Form a log or a ball with the dough and place on top of siliconized paper. Place everything on top of a pizza stone or cast iron skillet. Make a cut on the top of the log or call using a knife. Alternatively, place the log or ball in a bread loaf pan that has been previously greased with oil or Pam. Cover and let rest for approximately 1 hour or until the dough doubles in size. While the dough is resting preheat the oven to 392F (200C). If you are using a bread loaf pan you can preheat a pizza stone or similar inside the oven and that will give your bread a better crust. Spray the bread with filtered water. Put bread in the oven. Bake for about 2 minutes. Lower the oven temperature to 356F (180C). Bake the bread for approximately 35 minutes or until golden brown and sounds hollow when tapped. Remove the bread from the oven, let cool, and remove from the pan. Leave bread to cool completely on a rack. Slice when cool. Mix all of the ingredients in a bowl. Measure the appropriate quantity called by the recipe you are making. Use the flours that are healthier for the flour recipe below: such as sorghum and gluten free oat flour or make a combination of all to lower the glycemic index. The secret to this bread and all breads is the amount of water as it really depends on the water to give it the right texture, if you don't add enough it will be tough and heavy. You need to feel the dough, it definitely takes practice. Chef, gracias a tu receta al fin logré mi pan de caja, solo que lo hice vegano y mi mezcla de harinas es algo diferente (almendra-coco-linaza-avena) así que por eso pensé que no saldría y quedó genial! 👩🏻‍🍳👌🏻💪🏻🤗👏🏻 es la mejor y más sencilla que he encontrado! Mil gracias Lilian! Que gusto y felicidades! Me encanta saberlo. Abrazos! LIlian que rico! que cantidades mezclaste de esas harinas? en mi caso no puedo consumir el trigo en si, además del gluten es el trigo el que me da sensibilidad. Hola Gahavalet si debes usarlo. Compralo en tiendas orgánicas o en Costco en la Farmacia o en tiendas en línea.. Saludos! Hola chef tus recetas son lo maximo, muchas gracias por compartirlas y felicidades por tu excelente trabajo . Una pregunta si hago las recetas en thermomix tu crees que me queden bien? Hola Ana si claro. La mayoría de mis recetas las hago en Thermomix. Lo más fácil es donde dice procesador usas Thermomix y listo. Yo no uso los tiempos y velocidades como lo indican en Thermomix porque soy mas intuitiva y práctica. Gracias por tu pregunta. Si puedes por favor ir al Instagram de Thermomix Mexico y dejarles un mensaje de que quieres hacer mis recetas en la Thermomix me ayudaría mucho a colaborar con ellos (y hacer giveaways y demás para ustedes). Gracias y feliz año! Hey Buddy!, I found this information for you: "GLUTEN FREE SEEDED BREAD". 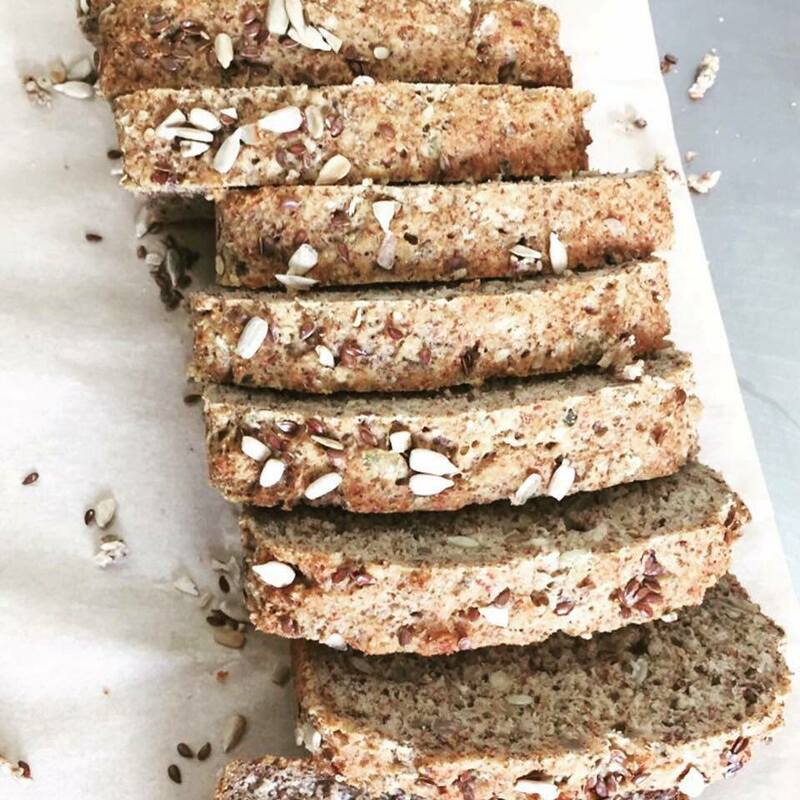 Here is the website link: https://www.vanessamusi.com/gluten-free-seeded-bread/. Thank you.